It’s all too easy to hammer along day after day on the main Australian bitchumised arteries, but we would miss so much of the real country we had wished to see and experience on this trip. In the planning phase, we hoped to travel some of the old explorer tracks and old pastoral gravel/sand highways that link century old homesteads and cattle stations. However, travelling for 12 months continuously and taking on some of these tracks comes with it’s own unique challenges – namely, try not breaking stuff in your van or tow vehicle in doing so. The amount of people we’ve met stuck in van parks for days, sometimes weeks, getting repairs and waiting on parts to arrive we’re too numerous for our liking. To highlight what I mean by this is ‘researching’ these old wonderful tracks current conditions, we tried to find out things like; the last time they were graded, recent rainfall, washout’s, how many road trains have been using them recently, has mustering been occurring etc … as a sort of risk analysis before making a decision and commitment to travel them. If we were travelling only for a month or two, then this type of decision making process is somewhat less involved because if we did break stuff it would have a less impact on our overall trip, but a 12 mth trip is different, to us at least, because repairing a van in the remote bush is not easy – especially to continue the journey. Therefore, finding a necessary and balanced conviction was important to determine which route we took and which to avoid (this time around). Our first track we wanted to do was the Oodnadatta track in SA. From doing the Flinder Ranges, it was either going the “big O” or doing a large back-track to Peterborough and then to Port Augusta. 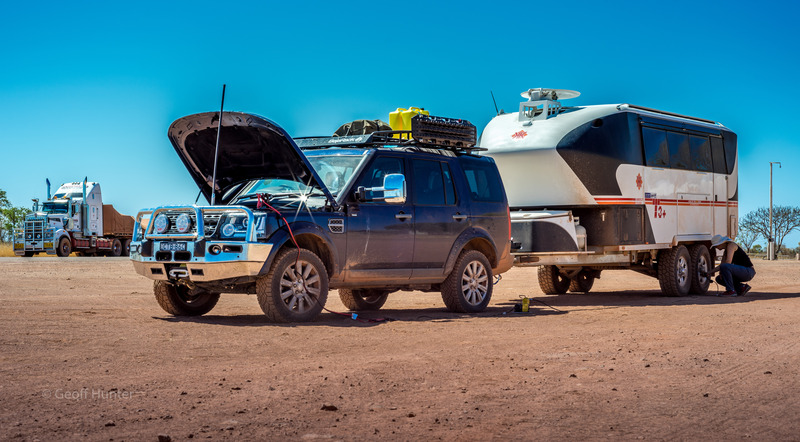 We had spoken to several off-road travellers in Wilpena and they all gave mixed opinions – most leaning towards avoid at this time of the season. As it turnd out, fortuitously I might add, I spoke to a local “country person” who only travelled the O two days before from Coober Pedy (just after 5 days of mild rainfall) and said the road was fine and he did it (comfortably?) in a 2WD car. We decided to commit and do it, take our time, ensure type pressures we’re right for road conditions and hopefully enjoy – and enjoy we did. In fact, some parts of it were so good it was better than some national bitumised highways we’ve travelled along on this trip. Celia with our trusty air compressor (sitting in the shadow of the D4) that runs off the D4’s spare battery – what a life saver this little noisy device is, but absolutely essential. The second track to-date we wanted to tackle was the Tanami Track short cut from Alice Springs NT to Halls Creek WA. The Tanami is 1073Kms through the Tanami desert with one section since 2011 of 684Kms, without fuel. The infamous track these days is mainly maintained by some gold mining company’s (Newmont) with minor investment from the NT and WA Govt’s. By doing the Tanami we would save a few days of extra travel to places we did not want to visit from going up through Katherine and over to Kunnunurra/Whyndam. The day before the Tanami departure however, we wanted to send some gear back to Sydney as we determined we did not need it and it was 26Kgs of dead weight we did not need to lug around any further. We went to Toll Transport in Alice to arrange the consignment and whist at Toll and thinking with excitement of our imminent departure, the thought occurred to me to ask one of the truck drivers who would know of the current Tanami conditions from driving it himself – and I’m glad we did. We were informed; “the Tanami was currently in very bad condition with anywhere from 6-12 inch corrugations (not a typo) mostly on the Northern Territory side, trucks are mostly limited to 40-50kms per hour, no grading has taken place in over 2.5 months, the wet season is fast approaching and almost every Toll truck in the past few weeks that had come back from the Tanami had to spend a day or two getting suspension or engine mount repairs – even on new trucks”. Hmmm we thought. Discretion is the better part of valour so we reluctantly decided against doing it, bought a bottle of wine (only allowed by law to purchase 1 x bottle per day in Alice) on way back to Van park, and researched another alternate route to WA’s Kimberley’s. So, the Hema map came out again and back to the drawing board and decided to head up to Katherine and proceeded north. Some 10 minutes up the road we came up to the Buchanan Hwy turn off. For what ever reason, I slowed down, turned left, rounded the corner and gently pulled over and looked straight down a long dead straight piece of deep red earth road that disappeared into the distant horizon. I looked across at Celia and we both said let’s do this and jumped out in the 35Deg heat and proceed to deflate our eight tyres in the midday sun. 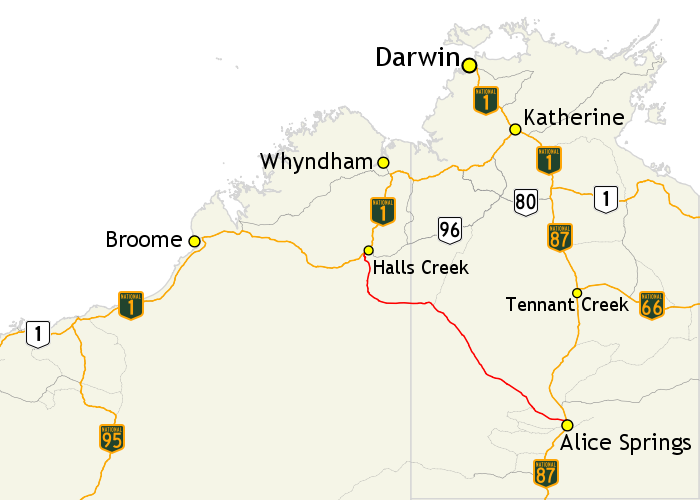 The Buchanan Highway (not really a Hwy – basic dirt track is more like it) is 170Kms from Dumarra across to Top Springs then another 148 Kms onto Timber Creek – see above map. If was rough, no doubt about it, but it was manageable and we drove to the conditions and van was fine in the end, nothing broke that I couldn’t quickly fix and we loved the experience with the isolation and remoteness only these old outback tracks can provide. Sometimes a simple “gut feel” and a weird sense of conviction makes all the difference to adding a little extra spice to your long journey whilst trying to balance all things considered in an effort to not break anything along the way. Here’s to many more decisions like this in the months to come and as we get closer back to NSW, no doubt they will get easier to make. Awesome stuff mate. Sounds like you’re having a ball. More photos please. That’s more like it! Some real dirt on the van. Looks like you are really mixing it with the outback. What a great adventure. We are getting the hot weather here now also. Mid thirties and plenty of black snakes in the paddocks. Keep up the good work, looking forward to the next one, Lucy has done the 2 english exams, only 4 more to go! Hehe .. I just might take some close ups of the van’s dirt but we’ve done quite a few river crossings lately so it’s looking rather clean’ish again. Nothing but salt spray here in Broome – start heading south for the Pilbara region tomorrow = lot’s more dirt. Best of luck to Lucy and all of her final exams!!! Copyright: Geoff Hunter & Celia Hunter - See Flickr site on the symbol over to the right for even higher res images than shown in this blog.